Tobacco is one of the most serious health threats the world has ever faced. Each year, around 6 million people worldwide die from tobacco use or exposure to tobacco smoke. This number could rise to more than 8 million globally by 2030, unless strong action to control tobacco is undertaken. Yet, tobacco is also the world's most preventable cause of death and disease. 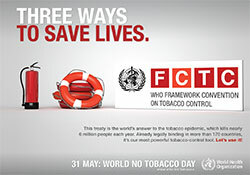 Tobacco can be successfully fought by means of a comprehensive set of tobacco control measures clearly stated in the WHO Framework Convention on Tobacco Control (WHO FCTC), which marked its 10th anniversary in 2015.